The expectation on inflation, rupee movement and portfolio outflows make a strong case for the RBI to hike rates by 25bps in its June policy. Markets are almost factoring that in. The RBI Monetary Policy is expected to be announced on June 6 after the meeting of the Monetary Policy Committee (MPC) concludes. For the last one year, the MPC has maintained a dovish stance on rates but shifted to a less accommodative approach. Among the six members of the MPC, only Dr. Michael Patra has been a strong votary for rate hikes. But, there was a subtle shift in the policy discussions in the April MPC. While only Dr. Patra voted in favour of a rate hike, most of the members did flag concerns over rising inflation and risk of the US Fed hiking rates. In the meanwhile, there is a new dimension to the rate debate in the form of a weakening rupee. Not surprisingly, bond market traders are increasingly veering towards a possible 25bps hike in the June 6 Monetary Policy announcement. Here is what the RBI decision tree on rates will look like. 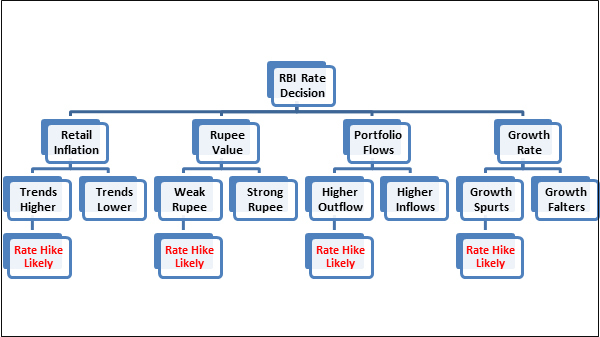 As the RBI decision tree above suggests, there are likely to be four factors that will drive the decision of the MPC when it comes to a view on rates. Let us focus on each of them. 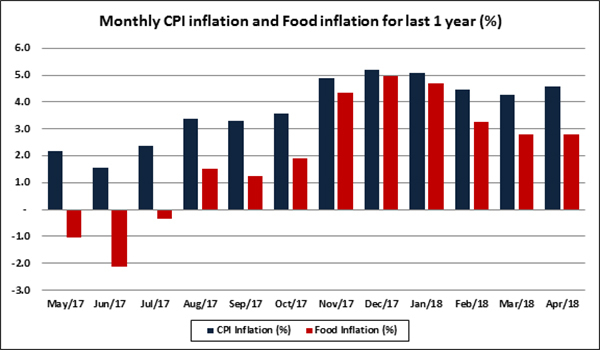 As is evident from the above chart, the levels of CPI inflation and food inflation are at a higher plane compared to one year back. The assured MSP and higher crude prices could only make matters tighter. Higher inflation expectations will compress the real rate of return forcing the RBI to hike rates in June. The year to date chart of the INR shows how it has weakened sharply against the US Dollar. 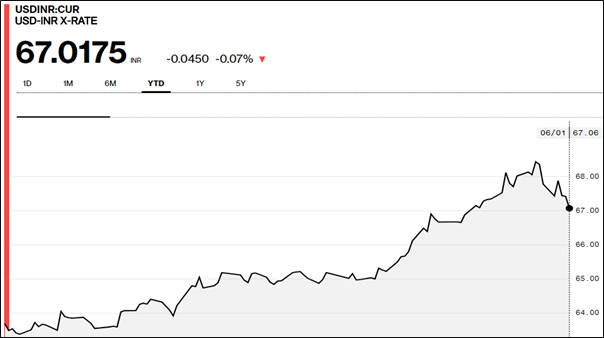 INR had touched a low of 68.50/$ before settling at around 67/$. This bounce in the INR was on the back of expectations that the RBI would hike rates in the June policy. But, how is the rupee related to interest rates. There is an interesting linkage. When imports go up sharply there are two implications: imported inflation rises and the trade deficit widens. We saw both these trends in the last few months. If inflation goes up and RBI increases the interest rates commensurately, then the impact on rupee may not be much. But if interest rates are not hiked (like the RBI did not hike rates), then the INR is likely to weaken. When the INR weakens, it benefits exporters but India’s imported inflation goes up further. So the RBI will have to prevent the INR from weakening beyond a point to check imported inflation. If rates are hiked then the pressure on the INR reduces. That may drive the RBI to hike rates. 3. How portfolio flows into India pan out? The last four months have seen debt outflows to the tune of Rs39,341cr ($6 billion) and that clearly indicates expectations of a Fed rate hike. That may impel the RBI to hike rates. The GDP growth has bounced back to 7.7% in the fourth quarter, but at a full year figure of 6.7%, GDP growth is nowhere close to froth territory. GDP growth may really become a worry for the RBI at a later stage. For now, it is more of the base effect playing out in the aftermath of the demonetization. In a nutshell, the expectation on inflation, rupee movement and portfolio outflows make a strong case for the RBI to hike rates by 25bps in its June policy. Markets are almost factoring that in. What will really be relevant is the RBI guidance on inflation and rates.